The safety of our beloved pets is important. 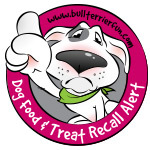 The high number of recall alerts on dog food, treats and toys is alerting. Therefore I have opened this category and try to keep it up-to-date in order to help and make recalls public. Please share recalls to help as many dog owners keeping their pets safe as possible! Reason: Carnivore Meat Company of Green Bay, Wisconsin is recalling a single lot of their Vital Essentials Frozen Chicken Entrees for Dogs because of potential contamination with Salmonella bacteria. Reason: Dave’s Pet Food of Agawam, Massachusetts is voluntarily recalling one production lot of its Dave’s Simply the Best dry dog food due to the presence of an “off odor”. Reason: Hill’s Science Diet is in the process of conducting a voluntary market withdrawal of various varieties of its canned dog food products for unspecified reasons.